“Old soldiers never die, they just fade away...” On April 9, 1942, the United States Army Forces Far East (USAFFE), the largest US army garrison in the Pacific, surrendered its 90,000 troops to the Japanese Imperial Army. More than 30,000 US Army and 60,000 Filipino soldiers of the Philippine Commonwealth surrendered after holding out for more than four months. This past Saturday, April 10, 2010, with over a hundred veterans, widows, and advocates in attendance, Justice for Filipino American Veterans (JFAV) and the Association of Widows, Advocates and Relatives for Equity (AWARE) remembered Bataan Day at the Filipino American Community of Los Angeles (FACLA) in Historic Filipinotown, Los Angeles, California. With the American and Philippine national anthems, the commemoration began with the acknowledgement of our mother nations for which these veterans had fought and sacrificed so much. Next, Pastor Sonny Rivera of the Walk by Faith Church of the Nazarene gave the invocation. On April 9, 1942, the United States Army Forces Far East (USAFFE), the largest US army garrison in the Pacific, surrendered its 90,000 troops to the Japanese Imperial Army. More than 30,000 US Army and 60,000 Filipino soldiers of the Philippine Commonwealth surrendered after holding out for more than four months. This past Saturday, April 10, 2010, with over a hundred veterans, widows, and advocates in attendance, Justice for Filipino American Veterans (JFAV) and the Association of Widows, Advocates and Relatives for Equity (AWARE) remembered Bataan Day at the Filipino American Community of Los Angeles (FACLA) in Historic Filipinotown, Los Angeles, California. With the American and Philippine national anthems, the commemoration began with the acknowledgement of our mother nations for which these veterans had fought and sacrificed so much. Next, Pastor Sonny Rivera of the Walk by Faith Church of the Nazarene gave the invocation. He was followed by the rousing opening remarks of AWARE Acting President, Jovy Alejandrino, who expounded upon the significance of the fall of Bataan. “There would be no safe America if there was no Bataan,” she declared. Additionally, Angela Bartolome issued a statement of solidarity on behalf of women's organization AF3IRM/GABNet LA and vowed their continued support of the veterans and widows for as long as it takes to achieve full equity. Throughout the day, the audience was entertained by the Silver Lake Adult Health Day Care dancers who regaled the crowd with Filipino folk dances and gospel singer Steve Kuban who sang a tribute song to the Philippines. 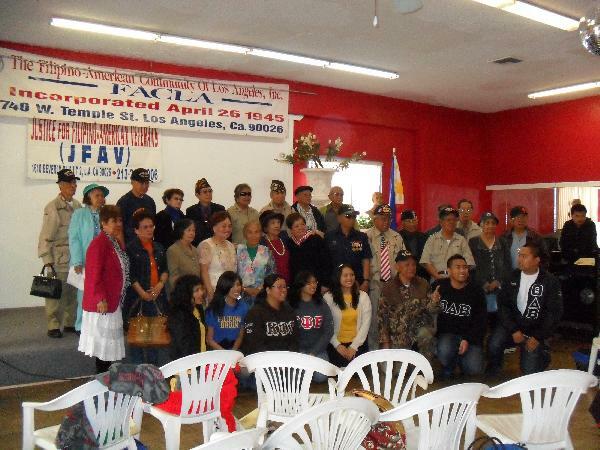 The pinnacle of the occasion was JFAV and AWARE's partnership with UCLA organizations Samahang Pilipino, Gawad Kalinga, Kappa Psi Epsilon—Delta Chapter, and Theta Delta Beta—Gamma Chapter who presented the veterans and widows with recognition certificates. Together, they endeavored to bridge the connection between the younger and elder generations. Concurrently, this year's Bataan Day commemoration also heralded the launch of the grassroots campaign to support the lawsuit that JFAV and the Migrant Heritage Commision's Attorney Arnedo Valera, Esq. will soon bring against the US Department of Veterans Affairs (DVA) against delayed claims and benefits for the widows and their dependents. JFAV and AWARE would like to especially thank the following sponsors and donors who helped make this commemoration a success: FACLA, Rampart Village Neighborhood Council, Walk by Faith Church of the Nazarene, Family Home Health, Four Seasons Quality Home Health, Silverlake Adult Daycare, Bahay Kubo Restaurant, Point Point (Turo-Turo), and Mr. Errol Santos—business development consultant for health industries.